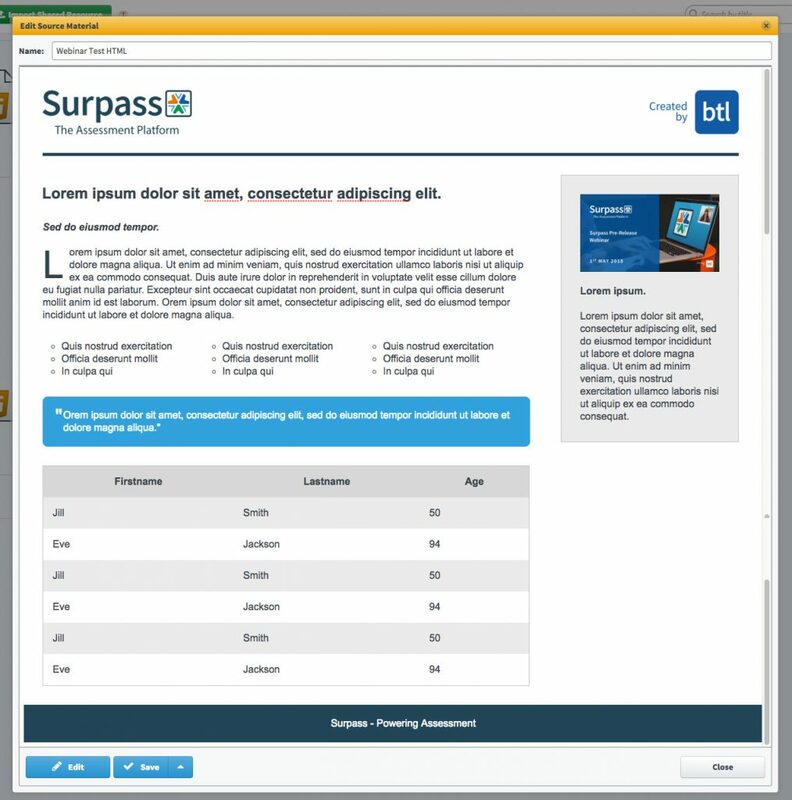 The latest release of Surpass has seen a number of new innovative features introduced to the assessment platform. In this article, we will introduce some of the additions that are hotly anticipated by the Surpass Community. However, if you would like a more comprehensive overview of all updates, these are available, as always, from the Knowledge Base. Some of the key updates were also covered by Tim Burnett and Jack Hobson in the Surpass Live pre-release. We’ve included relevant clips below. Being able to collaborate on item authoring and test building in Surpass makes it much easier for your team to ensure they are creating the best quality test possible. Now, we’ve made it even easier by giving item reviewers the ability to edit items within a review task. Reviewers can view the item history and edit all aspects of the item, including settings and tags. Edits made will be applied to the item in ‘Item Authoring’. This also allows your reviewers to make changes to items from ‘Tasks’ without having ‘Item Authoring’ permissions, making the item review and edit process more efficient. When reviewing a test in HTML delivery, you can now access a new quality review panel. This provides you with detailed information about the test and allows you to add comments at both item and test level during the review. When sharing a HTML compatible test in the Test Wizard, select ‘Schedule and Create Keycodes’ and ‘Enable Quality Review Panel’ to give reviewers access to this new panel. The panel shows information for the current test, section, and item you are reviewing. You can interact with the test as the candidate would and information, such as current score, will update. You can also download any comments that have been added before leaving the review. There have been two major improvements to HTML created source material in Surpass. The first is the ability to create tables in the source code and directly via the User Interface, allowing your authors greater freedom when creating engaging and more realistic layouts using rich content. In the video clip, Jack will show you how to create a simple table in seconds. For those of you with a creative flair (or access to a design team) below is an example of what can be achieved. We have also improved support for candidates using the highlighter function so that it can be used within HTML created source material. A selection of other options have been implemented into the test driver, allowing your authors to have more control over what the candidate can and can’t see during their test. On the surface, these may seem purely cosmetic, however members of the Surpass Community have requested their inclusion as it has been found to have a positive impact on the candidate experience in certain situations. More specific details on the introduction of each feature are available in the Surpass 12.14 release note. Please ask your account manager if you do not already have access. New options in the ‘Test Administration’ area of Surpass allow markers to escalate scripts that require further attention, for example, if the marker suspects plagiarism. This not only creates an easy-to-use environment for collaboration between markers and moderators, but Surpass will automatically safeguard against this response being submitted to ‘Results’. This action can also be performed in the ‘Moderate’ tab, and within the marking screen itself, and a comment history is available for thorough review. Finally, there is a short reminder that the help and support documentation can be accessed at any time from within Surpass by simply clicking the question mark icon in the top-right corner. Recently, the Documentation team have worked together with our UX (User Experience) Design team to improve the interactive interface of the support website, making it easier to navigate and find the relevant information. Surpass Learning Portal videos have also been embedded directly into these pages, offering you a choice of media in one location.